Art house cinema is a strange beast. As the word says, it’s all about art, which, depending on your taste, you can either appreciate or loathe. So when a film like Youth enters the world, you know that it is going to immediately divide the audience. Some will cherish it and call it a masterpiece, while others will openly announce it as pretentious. Not often will you find people sitting in the middle. Alas, that’s where I am with Paolo Sorrentino’s latest. There is plenty to admire while at the same time there are things that make it infuriating. Fred is a maestro conductor and composer. Mick is an accomplished film director. 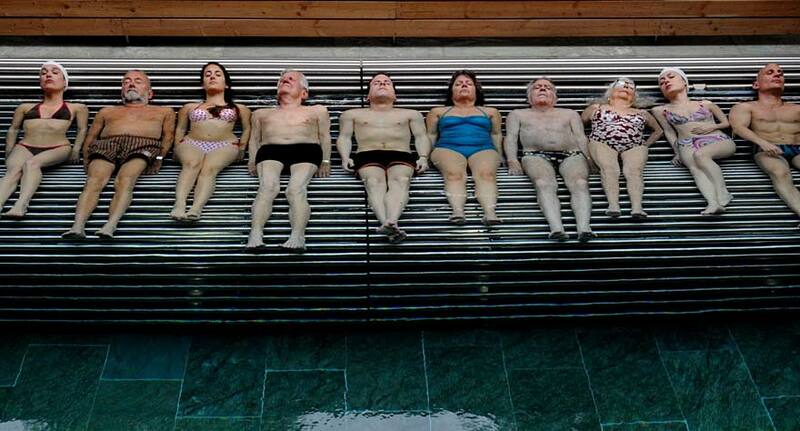 The pair are old friends who are spending time at a health spa in Switzerland. Fred is being pressured into coming out of retirement to perform his masterpiece for the Queen but is refusing, while Mick struggles to find an ending to his latest film, surrounded by screenwriters taking very different views. Into the mix is Fred’s daughter, Lena, who has been dumped by her husband, who just happens to be Mick’s son, while an American actor struggles with a most notorious role. At first, you feel that Youth is a very misleading title, when the central characters are old men in their twilight years but this is a film full of meanings and metaphors. The resort is full of diverse characters, from the overweight South American footballer with Karl Marx tattooed on his back, to Miss Universe who has a habit of wandering around naked, to the young masseuse who finds her only way of communicating is through touch while in her spare time she dances with cartoon characters. This is a real mixed bag of a movie. The plot seems insubstantial compared to the details of the characters and the supporting players. Sorrentino, whose last film was the critically acclaimed The Great Beauty, has a keen eye for character and especially when dealing with Fred and Mick, whose conversations are the high point of the film. It has humour and plenty of pathos but when you step away from the film, it a film about people clinging onto hopes and dreams and, in a way, their youth, hence why they are there. Music plays an important part to the film’s central core. From Fred’s fascination with sound (he flicks a sweet wrapper to produce a musical rhythm) to the use of Paloma Faith’s Can’t Rely On You video as a point of a nightmare, are both perfectly placed and sometimes infuriating. The finale, a long operatic sequence, is stunning. Yet while the film both frustrates and fascinates in equal measures (Sorrentino is hugely influenced by Fellini and you can see moments of 8 and a Half here) what does win you over are the performances from a very skilled cast indeed. Paul Dano, who likes the more quirkier of roles, plays another as the American film star who watches every move made in order to really develop his latest role, is quietly commanding. Rachel Weisz, who is making a real resurgence after her performance in last year’s The Lobster, is lovely as Fred’s spurned daughter. Even Jane Fonda, in a cameo role, almost steals the film as a queen diva film star also clinging onto her youth. Yet it is Michael Caine and Harvey Keitel who really make this film so interesting. As Mick, Keitel quietly underplays the part of a man battling with the dilemma of his latest work. He speaks volumes with just a look, especially during an amusing scene in which writers improvise the ending to his new film. As Fred, Michael Caine delivers his best performance in years. This is a sympathetic, charming man whose life has been devoted to music and to his wife, yet an air of stubbornness surrounds him now. The scenes between these two veterans are electric and if you can get over the sometimes pointless imagery, it’s worth your while spending time with these two masters. Youth is definitely going to divide the audiences and it is very flawed. It rambles along on occasions and doesn’t always get to the point but it is surprisingly moving and incredibly beautiful to watch. It might not ignite the box office but it’s a worthy venture just to see Caine and Keitel creating a terrific double act.